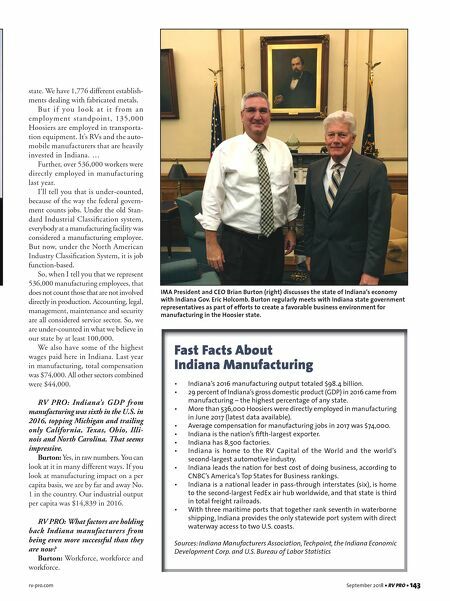 rv-pro.com September 2018 • RV PRO • 143 Fast Facts About Indiana Manufacturing • Indiana's 2016 manufacturing output totaled $98.4 billion. • 29 percent of Indiana's gross domestic product (GDP) in 2016 came from manufacturing – the highest percentage of any state. • More than 536,000 Hoosiers were directly employed in manufacturing in June 2017 (latest data available). • Average compensation for manufacturing jobs in 2017 was $74,000. • Indiana is the nation's fifth-largest exporter. • Indiana has 8,500 factories. • Indiana is home to the RV Capital of the World and the world's second-largest automotive industry. • Indiana leads the nation for best cost of doing business, according to CNBC's America's Top States for Business rankings. • Indiana is a national leader in pass-through interstates (six), is home to the second-largest FedEx air hub worldwide, and that state is third in total freight railroads. • With three maritime ports that together rank seventh in waterborne shipping, Indiana provides the only statewide port system with direct waterway access to two U.S. coasts. Sources: Indiana Manufacturers Association, Techpoint, the Indiana Economic Development Corp. and U.S. Bureau of Labor Statistics state. We have 1,776 different establish- ments dealing with fabricated metals. Bu t i f y o u l o o k a t i t f r o m a n employment standpoint, 135,000 Hoosiers are employed in transporta- tion equipment. It's RVs and the auto- mobile manufacturers that are heavily invested in Indiana. … Further, over 536,000 workers were directly employed in manufacturing last year. I'll tell you that is under-counted, because of the way the federal govern- ment counts jobs. Under the old Stan- dard Industrial Classification system, everybody at a manufacturing facility was considered a manufacturing employee. But now, under the North American Industry Classification System, it is job function-based. So, when I tell you that we represent 536,000 manufacturing employees, that does not count those that are not involved directly in production. Accounting, legal, management, maintenance and security are all considered service sector. So, we are under-counted in what we believe in our state by at least 100,000. We also have some of the highest wages paid here in Indiana. Last year in manufacturing, total compensation was $74,000. All other sectors combined were $44,000. RV PRO: Indiana's GDP from manufacturing was sixth in the U.S. in 2016, topping Michigan and trailing only California, Texas, Ohio, Illi- nois and North Carolina. That seems impressive. Burton: Yes, in raw numbers. You can look at it in many different ways. If you look at manufacturing impact on a per capita basis, we are by far and away No. 1 in the country. Our industrial output per capita was $14,839 in 2016. RV PRO: What factors are holding back Indiana manufacturers from being even more successful than they are now? Burton: Workforce, workforce and workforce. IMA President and CEO Brian Burton (right) discusses the state of Indiana's economy with Indiana Gov. Eric Holcomb. 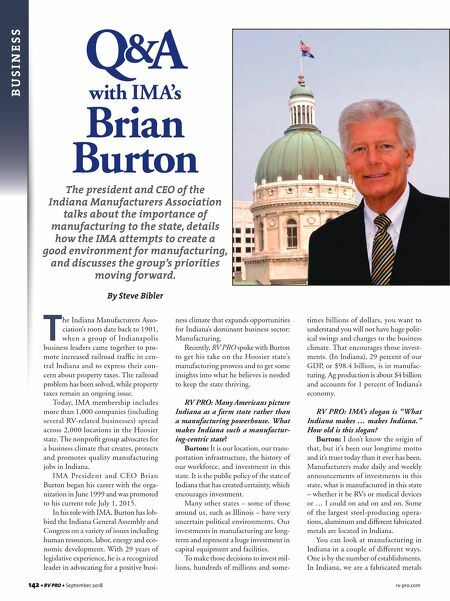 Burton regularly meets with Indiana state government representatives as part of efforts to create a favorable business environment for manufacturing in the Hoosier state.